Hello, I am approaching the android world in a more "serious" way having bought an Asus Zenfone Max Pro M2 with android 8.1.0 stock that I'm currently studying in offline mode without any sim. 1) There is a way to see connected apps without installing a firewall? 3) Why when I use the keyboard I get a notification "gboard update browsing experience in progress?" What's this? 4) Scan any apks before installing with the PC antivirus is OK? Or do I need an antivirus specific for smartphone? Alternatively can I send the apks to Virustotal? 5) If I enter the authorizations of the app x (tapping on "no authorization granted" item) I see the storage disabled with the slider; but if I click on "all permissions" from the menu with the 3 dots I see different things, for example archiving says reading and modifying contents of the usb archive and others that cannot be deactivated. Why this difference? 6) What is the difference between stopping an app in the app settings and stopping in the running services of the developer options? Welcome to Android Central! I'll try to answer some of the questions. 2. System apps or preinstalled apps from the manufacturer don't always show up in the App Drawer. "ASUS Demo" might be for the demo mode that you see when the phone is on display in a store, and might only be accessible to the retailer. 3. I've never seen that before -- is that a notification appearing in the status bar at the top of the screen, or is it a message that appears in a window in the middle of the screen? 4. I would strongly recommend against relying on apks files downloaded from random websites, and instead install apps from trusted sources like the Play Store or the Amazon Appstore. Apart from the risk of malware, sites that offer apk files often indirectly (or directly) encourage piracy, which is a big no-no on this forum. 5. I'm not sure what you're referring to here -- you'll have to give more details. 6. Stopping an app either way is most likely the same thing. But the important thing to remember is that in Android, there's almost never a need to force an app to close (unless it's frozen or misbehaving). Let the system manage your RAM -- Android is designed to keep apps in RAM for more efficient app opening and swapping. 2) So why I See "force stop" button for "Asus demo" app? This app is running? How I can verify that? 4) I was referring to open source applications, anyway my question was about the antivirus, I need a specific antivirus for smartphones or can I scan apks with the PC antivirus? 5) See this screenshots (sorry for the language, I wrote translation in red). The contacts slider is deactivated, but if I go on "All permissions" I see "read personal contacts". 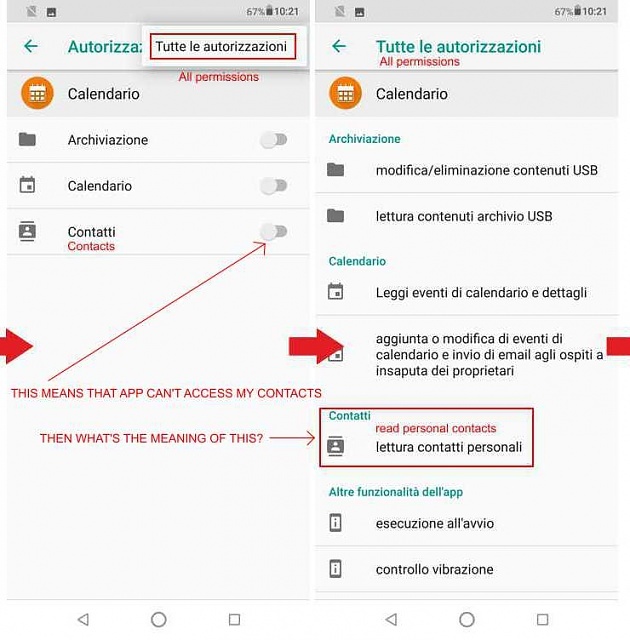 The last message says: "Allows the application to read the data related to your contacts stored on the phone, including the frequency with which you have made calls, sent emails or communicated in other ways with specific individuals. This permission allows applications to save the data of your contacts and malicious applications may share contact data without your knowledge"
The Force Stop button is always available -- it doesn't mean the app is currently active, or paused in the background. I'm not sure about how well PC antivirus programs work to detect Android malware. I'd look carefully at the PC antivirus program's details to see if they say it can detect Android malware vs PC malware. If it's not clear, contact their support team. I believe the "All Permissions" option is simply giving you more details about what those permissions provide. I don't think those are additional options you can select. see this; I was entering a contact as test and I soon as I touched the keyboard, this notification appeared. What are trying to download? I've disabled all the deactivable on gboard: permissions, suggestions, spelling correction, etc. After all what I didn't understand is: does this app access my contacts or not?? I'm not sure what the Gboard download is -- it could be trying to download an offline language dictionary, or perhaps a library of emojis, GIFs, or stickers. I'll have to defer to others in the forum who might know more about that. If you turn on the Contact permission toggle, then yes, the app will have access to your contacts. What I mentioned before was that the second screenshot only gives you more detail about what allowing Contact permissions means. That doesn't mean it's currently giving the phone those permissions -- the actual toggle switch is what you use to grant the permission. I realized that I made a mistake in the translation of the gboard notification; isn't "update browsing experience in progress" but "update TYPING experience in progress"
Not sure about that -- maybe someone on the forums who has worked in a wireless store can comment. Perhaps there's a hidden menu code that you can enter into the Phone dialpad or Calculator that activates it? « Photo full-size preview in text message?